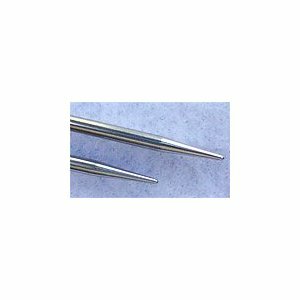 TWIST Lace circular needle tips are made from high quality stainless steel. Each size is conveniently laser imprinted on the needle in both the US and metric size. Choose between 4 and 5 long tips. Knitter's Pride Zing Normal Interchangeable Needle Tips Needles and Knitter's Pride Karbonz Normal Interchangeable Needle Tips Needles are both similar needles: 5", interchangeable tips, and US 5 (3.75mm) US size.